I don’t buy many full boxes of cigars. I especially don’t often buy boxes that retail for over $300, or when the only vitola in stock is not one (or unlikely to be one) of my favorites. But in the case of Sobremesa—the debut blend from Steve Saka’s Dunbarton Tobacco & Trust—I’m apparently willing to make an exception. In December, Florida-based online retailer Smoke Inn had 25-count boxes in the Gran Imperiales (7 x 54) size for just under $303.95, or about $12.16 per stick. It was the only vitola in stock at the time. Normally I’d wait for a smaller size to become available, since my tastes usually skew towards thinner, shorter cigars. After such good experiences with the Cervantes Fino and El Americano, though, I jumped at the chance to stock up on the blend—even if the large size isn’t something I’d typically go for, especially in a box purchase. After smoking my way through eight Gran Imperiales, I’ve concluded I absolutely enjoy this cigar immensely and do not regret the box purchase in the slightest. That said, the largest Sobremesa vitola is not my favorite format in which to experience the blend, though I’ll relish firing up my remaining stash. Like its Sobremesa brethren, Gran Imperiales boasts an Ecuadorian Habano Rosado wrapper, a Mexican binder, and a filler blend of Pennsylvania Broadleaf Ligero with four different Nicaraguan tobaccos (Gk Condega C-SG Seco, Pueblo Nuevo Criollo Viso, La Joya Estelí C-98 Viso, and ASP Estelí Hybrid Ligero). It is handmade at Joya de Nicaragua. More than the smaller Sobremesa formats, the Gran Imperiales looks a little more rustic with its prominent seams and network of veins on full display. Across the samples I’ve smoked, several have had minor imperfections (a tiny hole in the thin wrapper leaf, a little errant adhesive, some ruggedness at the head or foot), but nothing that really detracts from the smoking experience. Once an even burn is established, pre-light notes of cocoa powder and earth transition to a profile that’s becoming dangerously familiar and pleasing to my palate. Simultaneously creamy, smooth, sweet, and well-balanced, the most noticeable flavors include cocoa, café au lait, cinammon, and nuts, along with hints of both red and black pepper. Sometimes I pick up green raisin, other times caramel or honey. Notably, in comparison to the Cervantes Fino, the intensity and concentration is toned down. This is the softest Sobremesa in the portfolio so, when you select it, you’re trading strength and fullness for more subtlety and (obviously) a longer smoking experience. Whatever size you choose, though, construction will be perfect. Literally every time I’ve had a Sobremesa—including the eight Gran Imperiales I smoked for this review—the combustion qualities were nothing short of top-notch. My pledge is to review the remaining Sobremesa vitolas this year (it’s a tough job, but somebody’s got to do it). Many of you, I suspect, are eager to get your hands on this blend if you haven’t already done so, and I’d like to help you select the best size for your palate. In this case, the Gran Imperiales would be your choice for smoothness, intricacy, and approachability. Just make sure you have enough time to smoke before you light it up; you won’t want to extinguish this large smoke before you hit the nub. This awesome cigar is worthy of four and a half stogies out of five. Tasted like a milder Joya Antaño Corojo, frankly. Don’t get the hoopla. You’ve reviewed this cigar how many times? 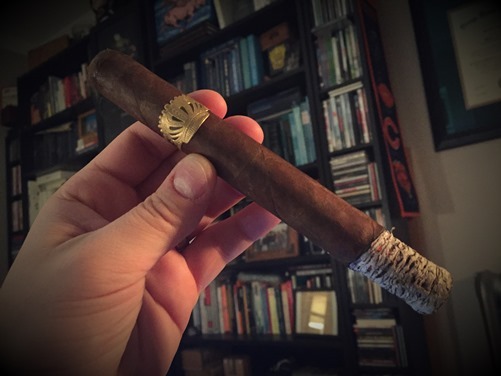 JMac – You and I have a different take on this blend, which is fine. This blend really hits home for me. To answer your question, I’ve reviewed the Gran Imperiales and Cervantes Fino, and I wrote a Quick Smoke on El Americano. I think this blend really tastes differently in its various sizes. JMac – fwiw, out of the seven tobaccos in the Sobremesa only one, the ASP Hybrid Ligero is the same. Appreciate your trying it – thanks! Fwiw, out of the seven tobaccos in the Sobremesa only one, the ASP Hybrid Ligero is the same. Appreciate your trying it – thanks! Way too pricey for me. Can’t wait to try it! Love the looks of your smoking den, excluding that godawful Bears pennant. At least you’re not displaying your autographed copy of the Jay Cutler anything! Butkus or Urlacher I could respect (at least before the hair plugs), but the current team seems to lack gravitas. Can you imagine Gale Sayers, let alone Brian Piccolo, on the team now?! ?